Smart solid wood coat rack in Mikado look. Timeless, beautiful furnishing accessories. 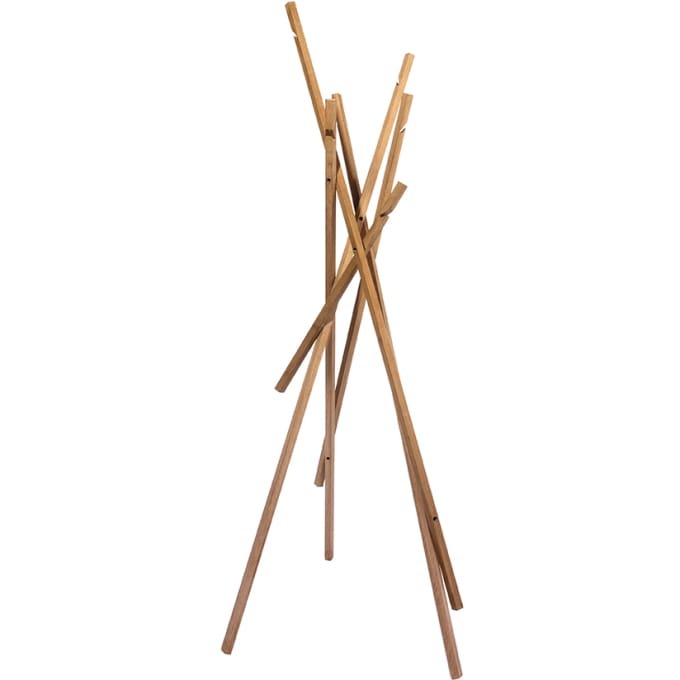 Mikado for advanced - 6 rods made of solid wood are based in seemingly random constellation together and form a apparently fragile, but actually very stable object, which on its own is already a beautiful decor addition. The practical noch at the top of the bars serves as a final coat hook and can hold clothes. The STICKS coat holder is a timeless favourite. In natural, oiled walnut or oak, STICKS brings to mind a walk in the woods. Without coats on it, and in black, white or pink painted ash, it could even launch a second career as an art installation – but when doing its job, its down-to-earth practicality becomes apparent and shows what really makes STICKS special. Moreover, to encourage kids to hang up their stuff too, Sticks Mini is available in white, rosé or aqua and is guaranteed to make tidying up more fun. Do you have a question about "Sticks"? How can we contact you?